Back during the revolutionary war, when the USA was busy ridding themselves of British colonial rule, ordinary countrymen rose up as a militia and fought for their independence. History would have you believe that the entire country was in a battle against the British. This is not what happened at all. As a matter of fact the majority of the people either supported independence, supported British colonial rule, or simply did not care either way. A very small group of people did the actual fighting. These people included the signers of the Declaration of Independence and the armed militia that followed them. This group is known as the three percenters, and they still exist to this day through their family heritage and hereditary resolve for indepence from oppressive government control. Nothing puts this on prouder display that this vinyl decal that features the three percenter emblem sitting on punisher skull. This vinyl decal is red and measures 12x12 inches. 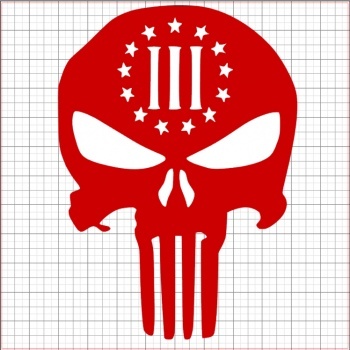 Do you own Punisher Three Percenter Red Vinyl Decal 12x12? Tell us about it! Have a question? Ask!